Janine Ebling- postnatal doula. Guildford, Woking, Surrey. Postnatal doula in Guildford. 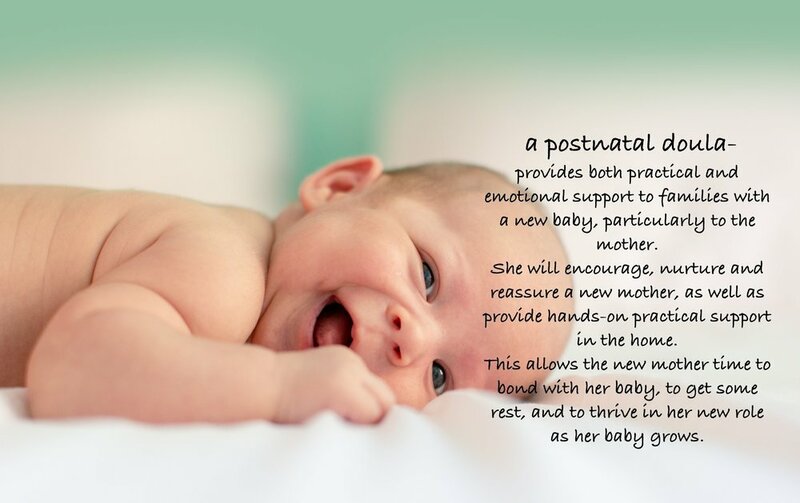 What is a postnatal doula? How will she help a new mother and baby? What support will a postnatal doula offer? As a postnatal doula, my role is to provide both practical and emotional support to families with a new baby, particularly to the mother. Sometimes the term 'mothering the mother' is used to refer to a postnatal doula's work. Many couples expecting a baby find themselves well informed about labour and birth through attending antenatal classes, but feel very poorly prepared for caring a new baby. It can be a daunting prospect to be fully responsible for the care of a baby, when you might have little previous experience or knowledge. Maybe you are having twins or multiples or are worried about Caesarean recovery? Perhaps you feel at risk for postnatal depression and want some additional support in place? This is where I can be of invaluable help as a postnatal doula. My role involves nurturing and caring for a new mother as she grows in confidence and competence in the skills required, and of course, being a support to the partner and any other children in the family. I will also be very hands-on in the practical help I offer in order to keep the household running smoothly, allowing the mother time to focus on and bond with her baby and recover from the birth. I will be a calming and reassuring presence in your home and will help you through the early days with a new baby. Why don't you take 2 minutes to watch my slideshow video of what a postnatal doula does during a day with a family at home?